Every year, ethics and compliance professionals gather data from reports made through their hotline and case management systems. But how do you put that data into perspective to demonstrate program effectiveness and report meaningful and actionable data to senior leadership and the board? 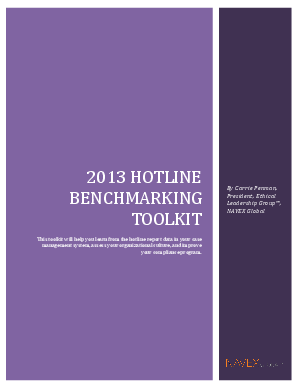 The 2013 Ethics and Compliance Hotline Benchmark toolkit is a resource you can use to benchmark your compliance program against industry standards and provide actionable insights into policy management, training, awareness, and more. Helpline data that is carefully tracked, reviewed, benchmarked, and presented with context often provides the early warning signs needed to detect, prevent, and resolve problems. This report shares the latest 2012 trends and benchmarking data from the NAVEX Global reporting database—the largest database of its kind in the world. Do enough employees know about our reporting channels?